Hubby and I had a chance to buy several shirts at a thrift store (UK, acronym for ukay-ukay) last week. I had fun choosing colorful shirts in cotton fabric. It’s rare that we visit a thrift store but last week we were able to find this newly opened bundle of shirts at an ukay store. The good ones are still intact so I had a feast day choosing the ones I like. 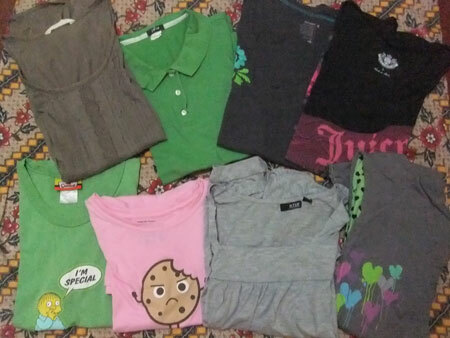 I was able to grab six shirts and three more for my daughter for only P540.00 or more than $1 for each shirt. My shirts are one size smaller now (from extra-large to large). They are not new from plus sized at Sydneys Closet, but they are still in good condition. This entry was posted in Outfit and tagged shirts, thrifted shirts on October 21, 2012 by Mommy Yam.